Burton, Robert [pseud. Democritus Junior]. 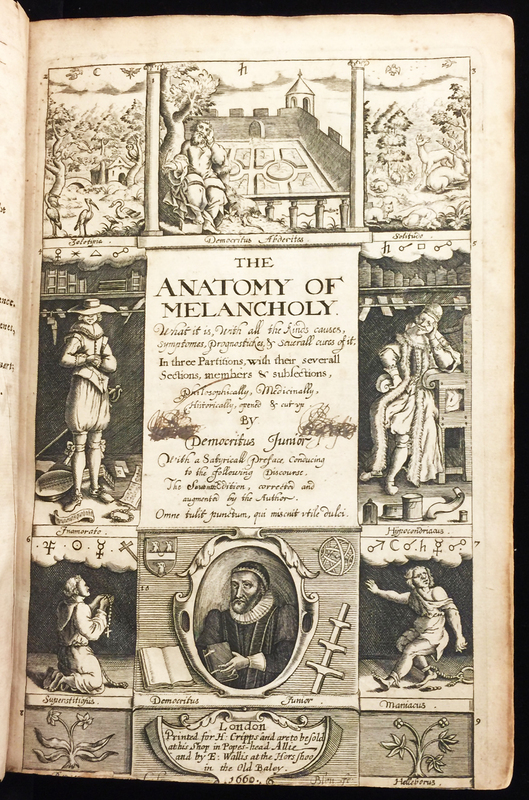 The anatomy of melancholy, what it is, with all the kinds causes, symptomes, prognostickes, & severall cures of it. 7th ed. London: printed [by R.W.] for H. Cripps [and Lodowick Lloyd] and to be sold by Cripps, [Andrew Crook], and E. Wallis, 1660. Provenance: Morris (purchased for £1 16s.). — Richard Bennett. — Sotheby 1898, lot 333. — Huntington Library (Rare books 113976). References: Ellis valuation, fol. 48b (£1 10s.). — ESTC (R483187). — MS catalogue (1), fol. 11. — MS catalogue (2), no. 368 (with three X’s next to it).